Organic potato sales rose by more than 14% in 2016. Potatoes are a good entry point for consumers into the organic market because they are a staple item and the price difference is not insurmountable. Promote organic growing practices to attract more consumers. For more information on variety characteristics, visit our conventional potatoes page. Promote the organic growing practices involved in growing organic potatoes. Because potatoes are a crop that is harvested from beneath the soil, consumers may be interested in learning about the de-creased pesticides and healthy soil practices used to grow them. Include organic potatoes in a baked potato promotions that includes organic butter, sour cream, cheese and bacon. Make organic potatoes a highlight of summertime grilling promotions. Cross-merchandise them with organic meat. Mashed potatoes are a staple of both winter and spring holiday meals. Promote organic potatoes as an integral part of holiday celebrations. Don’t forget red, gold and fingerling potatoes. Promote them as a fun way to get kids interested in eating their vegetables as their bright colors and odd shapes make them more interesting to the younger set. A variety of specialty potatoes are grown as organic, including purple, gold and fingerling varie-ties. Create a large organic potato display by including specialty varieties on the display. Consider creating a larger display by offering conventional product on one side of the display and organic potatoes on the other, using the appropriate barriers in between. Place organic onions and potatoes next to each other. They are a common pairing, and consumers are familiar with looking for the two together. Offer both bagged and bulk options. Be aware that constant exposure to light will cause potatoes to turn green. Consider a secondary organic potato and onion display in the meat department to create a one-stop shop for grillers. Organic potatoes are available in a variety of pack options, including custom packs. 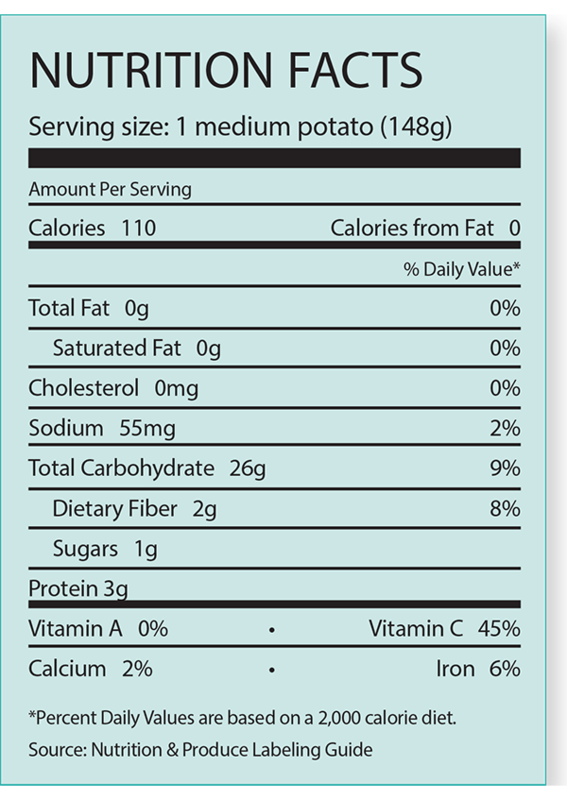 Organic fingerling potatoes are most often available in cartons of 16, 1.5-pound bags or 12, 2-pound bags. Organic gold potatoes are available in cartons of 24, 2-pound bags while purple organic potatoes can be found in 50-pound cartons. Avoid prolonged exposure to light because even a small amount of exposure can cause potatoes to green. Early- and summer-harvested potatoes usually are not held in long-term storage. However, about 75% of the fall potato crop is usually stored in farm or commercial warehouses. Tablestock in storage requires a temperature of 45 F (7 C), when a sprout inhibitor is used. Temperatures maintained for an extended period of time below 40 F (4.4 C), can cause product to adopt a sweet flavor. Higher temperatures encourage sprouting and shriveling. Sprouted potatoes can still be used once the sprout is broken off and the potato is peeled. Selecting potatoes without irregular shapes will result in less waste when peeling. Just 7% of consumers who purchased potatoes said they exclusively purchased organic potatoes. However, another 12% of those who bought potatoes said they bought both conventional and organic potatoes.